PS4 Pro vs Xbox One X: how do they compare? | What Hi-Fi? PS4 Pro vs Xbox One X: how do they compare? Since 4K first launched, 4K TVs have become more affordable, availability of content has increased thanks to streaming, Ultra HD Blu-rays and 4K Blu-ray players from LG, Oppo, Panasonic, Samsung and Sony. Following behind are 4K games consoles. The Xbox One S arrived with support for 4K video but doesn't support 4K games - for that, we will have to wait until November 2017 for Microsoft to release Xbox One X.
Sony's PS4 Pro finds itself between the two Microsoft consoles. Like Xbox One S it's capable of 4K HDR video. But whereas the One S can't play games in 4K, some smaller PS4 Pro games will be in native 4K, with the majority likely to be upscaled to 2160p. This sees it giving ground to the Xbox One X, which has been built from the ground up as a console for native 4K gaming. So how do they compare in terms of specification, features and performance? And which 4K console should you be looking to get? We run the rule over what we know so far. MORE: HDR TV - what is it? How can you get it? Sony's mid-generation refresh is less a new console and more a supercharged PS4. It sits alongside the PS4 slim as a high-end, 4K alternative. The PS4 Pro features an 8-core 64-bit AMD processor – the same as the PS4 at launch – clocked at 2.1GHz instead of the PS4’s 1.6GHz. The RAM configuration remains the same (8GB of GDDR5) but with a few improvements. There's 512MB more memory and 24 per cent more bandwidth (176GB/s to 218GB/s), making the Pro faster than the original PS4 in the processing stakes. The GPU performance has been doubled and, in combination with the faster CPU, there are noticeable improvements to performance. Better textures, higher frame-rates and a smoother performance are among the highlights. However, these improvements won't necessarily mean the Pro can play games in native 4K. Several are available, but the majority of games require more power that the Pro is capable of. Through a number of upscaling solutions (such as checkerboarding), PS4 Pro games can produce some remarkable visuals - not in native 4K but impressive enough. On paper, the Xbox One X makes good on Microsoft's stated desire to produce the most powerful gaming console ever made. Like the Pro it has 1TB storage as standard and eight CPU cores, but that's where the similarities end. Instead of the Pro's 8GB's of RAM, the One X has 12GB DDR5 of RAM and 326GB/s of memory bandwidth, trouncing the Pro's 218GB/s. What does that mean? In theory the One X zooms past the Pro, and it's likely the real-world gaming performance will bear that superiority out. Of the few Xbox One X games and demos shown at E3 2017, many were running on units that aspire to the fina performance of the latest One - so we didn't necessarily see the true power of the console. Despite this, the games looked great in native 4K HDR 60fps (though we heard third-party titles were using a form of checkerboarding (upscaling) to reach 4K resolution). Both the Pro and the Xbox One X have 4K as their raison d'être. The expectation is the One X will feature native 4K efforts, and 'enhanced' One and 360 titles will be upscaled to 4K. From our brief hands-on of Forza Motorsport 7, the performance is a step above the Pro. For the 'enhanced' titles the results are less impressive. They're great -ooking games but the uptick in quality doesn't seem to be as immediate. As the Pro is less powerful, we'd expect less demanding games to be in native 4K while more data-heavy games such as Horizon: Zero Dawn will hit 1440p and be upscaled to 2160p. MORE: UHD and 4K TV - what is it? We suspect, what with having opted out of joining the Ultra HD Alliance, Sony may come up with its own interpretation of HDR - as it has done with its TVs. The One X will support most variants of HDR, but at the moment there is no support for Dolby Vision. The Pro does not feature an Ultra HD Blu-ray drive, surprising considering the emergence of Sony's UBP-X800. Instead users will have to rely on 4K apps, whether it's PlayStation Video, YouTube, Netflix or Amazon - though, as far as we can tell, Amazon, Netflix and YouTube are still awaiting an HDR update. The One X will ship with a 4K UHD drive. It's likely to be similar to the one we saw in the One S, which produced a "punchy, vibrant picture" but was not the match of dedicated 4K Blu-ray players from Panasonic or Sony. Microsoft does not intend to make platform-exclusive games for the One X. If you can play on the One S, it will be available – with better quality graphics and performance – on the One X and vice versa. There is, however, a small caveat to that statement. VR versions of games are likely to be tied soley to the One X and not available on other Xbox systems. At E3 2017, Phil Spencer announced what we suspected would happen: Xbox 360 games will also be available to play on the One X. He lobbed in a surprise by revealing the original Xbox games are coming to the platform too. Not all games will be available due to licensing and rights issues, but you can expect a selected number of titles to be playable. PS4 games are required to have a base mode and a 'Pro' mode. Games can run on both the PS4 and Pro, but the performance boost will only be seen on the Pro console. Older games can be patched to be Pro compatible, too. This upgrade will be available at no extra cost - Sony clearly doesn't want to alienate its 40 million-strong user base. It's a similar idea with online gaming, with players on both systems able to play against each other. Sony has indicated no game content will be exclusive to the PS4 Pro console. For games that haven't received a Pro patch, Sony released a 'Boost Mode" update in early 2017 that ekes more power out of the console. This update doesn't add HDR/4K or turn games locked at 30fps into 60fps behemoths, but it should ensure more consistent performance. Loading times may be a smidge faster, the frame rate a bit higher and more consistent. Virtual reality is seen as the 'next big thing' in gaming. The Oculus Rift, HTC Vive and Samsung Gear VR have brought virtual reality into the mainstream consciousness - Microsoft and Sony are looking to take advantage. Sony's PlayStation VR (£350) works with all PS4s (the PlayStation camera is required). So far there haven't been many performance improvements, but the extra power has led to increases in resolution. Little is known of Microsoft's VR plans, although we do know Fallout VR is closing in on a release date. Microsoft has a relationship with Oculus - each Rift comes with an Xbox One controller - but it remains to be seen if the partnership will become more extensive. Microsoft views VR as separate to traditional, controller-based video games - that's why VR games are exclusive to the One X. We expect the Xbox's extra power should ensure it hits a higher VR performance than the PS4's more compromised equivalent. As a mid-generation refresh – a console Sony has said will be profitable from the off – the PS4 Pro is available for £336, undercutting its rival by a significant amount. It's certainly selling better than expected, with one in five consoles sold being a Pro. The One X has been built for a premium game experience, and so the announced price of £450 is no surprise. Considering it can produce native 4K images, something the PS4 Pro can do only with a few titles, the price difference may be justified. It'll be very interesting to see the sales of the console as, of course, to see the best of it you will need a 4K TV. Although they both output at 4K, neither console is truly competing with the other. 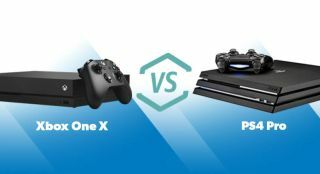 The Pro was released in November 2016 while the One X arrives a year later – a lifetime in terms of console launches. While the presence of the Pro has likely led to an uptick in 4K TV sales, if you already have a PS4 Pro would you necessarily fork out £450 for another console? We're not sure. It's fair to say the Xbox One X is the more interesting proposition and will undoubtedly bring gaming more fully into the 4K era, but will games be all that different from their PS4 counterparts? Can Microsoft innovate through its game studios to create gaming experiences that rely on something other than "it's in 4K"? That remains to be seen. For many, it will come down to the games, rather than 4K or the services on offer. Stay tuned, as we'll be updating this page as more information comes through.